I checked in with two of the most seasoned travelers out there right now–David and Ana Hoffman of Davids Been Here to get their advice about somewhere I am DYING to go–Santorini! Santorini shines as one of the world’s most illustrious luxury travel destinations. You’ve likely seen the island’s whitewashed villages and crystalline waters splashed over print ads and immortalized in Hollywood movies, but have you ever given serious thought to experiencing Santorini for yourself? The island boasts world-class accommodations, a unique gastronomy, and some of the best sunset views in the Aegean. Here is a quick guide from David and Ana about where to stay and what to do in seductive Santorini. The volcanic activity that gave Santorini its crescent shape also gave birth to a number of stunning beaches. 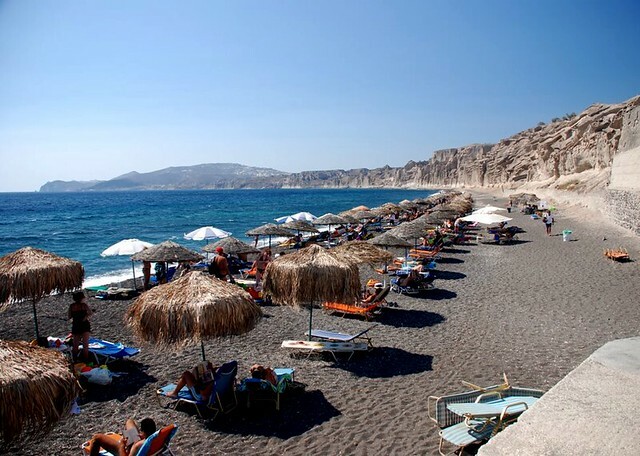 Kamari Beach is perhaps the most touristy of Santorini’s beaches, but does offer plenty of facilities, restaurants, and is easily reached by bus or taxi. Vlychada Beach is not as busy as Kamari since it is only accessible by car. Its Chalky cliffs and fine sand give it a beautiful character, and an availability of lounge chairs makes Vlychada ideal for couples in search of a little privacy and relaxation. Vlychada also has a handful of local tavernas and bathrooms nearby so you won’t have to rough it. Red Beach’s name comes from the intense red hues of its cliffs. Though it features no amenities or facilities, Red Beach remains trendy for its raw natural beauty. Beachgoers should bring their own umbrellas, water, and food. Though the most remote out of the three, you can catch the boat to Red Beach for €5 from the road below the Rihidi archeological site, or you can stash the car in front of the Agios Nikolaos chapel and walk the rest of the way. By 1650 B.C. Santorini was home to a thriving city known as Akrotiri, but a devastating volcanic eruption destroyed Akrotiri sometime around 1614 B.C. Though archaeologists speculate that its citizens were able to flee the disaster, the city they left behind was covered with a thick layer of volcanic debris and subsequently preserved for the next 2,000 years! 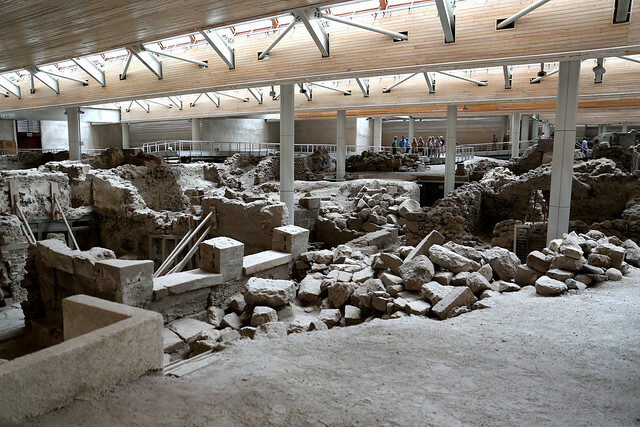 Ancient Akrotiri is now one of the most significant archaeological sites in the eastern Mediterranean and has been nicknamed “the Pompeii of the Aegean.” The site is open every day except Monday. Admission is €5. 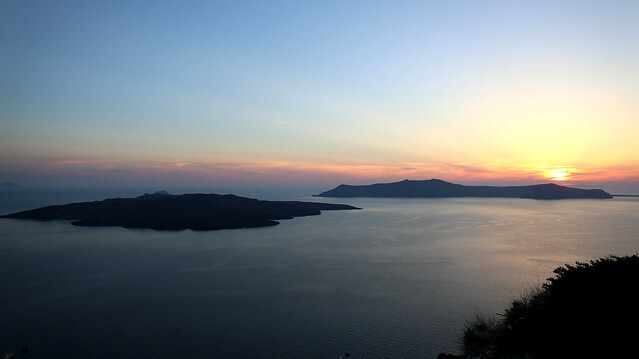 The truth is that you can watch a great sunset from anywhere in the world, but what makes Santorini sunsets so spectacular is watching the sun dip down over the caldera. But you don’t just have to watch the sunset, you can experience it! We recommend a sunset cruise with Santorini Sailing or a romantic lobster dinner for two at Dimitri’s Taverna in Ammoudi Port. Santorini is home to designer boutiques, reputable art galleries, and outstanding jewelry stores. Fira’s Ypapantis Street is the best place to shop for fine gold pieces, which is how it earned its nickname, “Gold Street.” For clothes, head to Oia’s main street where the window displays flaunt high-end fashion labels and the work of talented Greek designers. Oia is also a great place to buy handmade purses and accessories such as scarves, belts, and costume jewelry. For unique art pieces, we recommend MATI Art Gallery (Fira) and Oia Treasures (Oia). 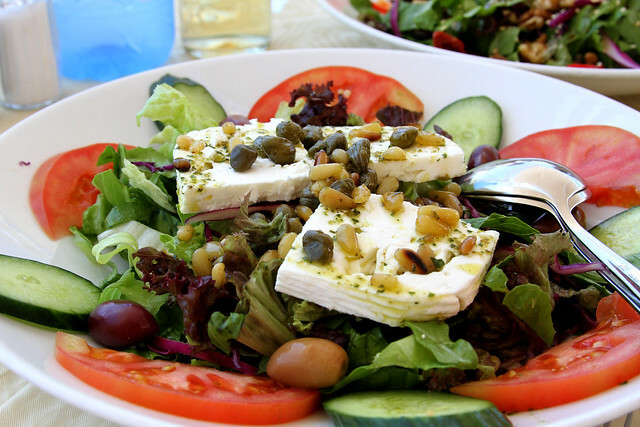 Ambrosia We love it because of its spectacular caldera views, modern Greek menu, and food presentation. Nichteri We love it because of the chef’s ability to incorporate local ingredients into superb fusion dishes just steps from the black sands of Kamari Beach. Selene Bistro We love it because of its Michelin-Star worthy cuisine and romantic setting in traditional Pyrgos Village. Santorini isn’t a budget destination, but if you are willing to invest in an unforgettable vacation, this magical island is for you. 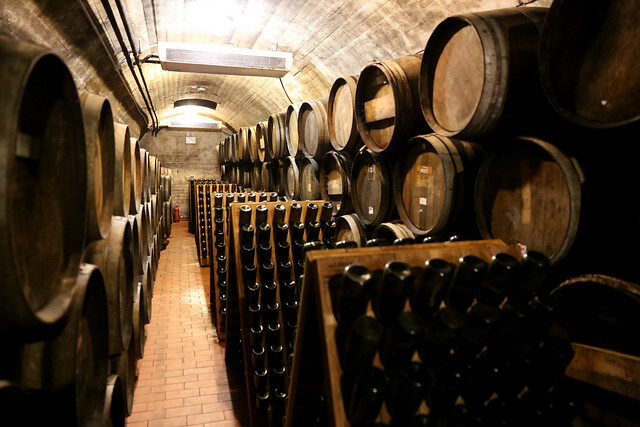 These days you get what you pay for in travel, and though it’s a splurge for most, you’ll never visit a place more enchanting. David Hoffmann is the founder of Davidsbeenhere.com, a travel website dedicated to helping others travel independently. David has traveled to 54 countries and has published more than 50 guidebooks on Amazon.com Kindle Store. He and his wife Ana use their experiences to help people travel smarter. Connect with David on Facebook, Twitter, and Instagram. It’s not a budget destination, but the islands are pretty affordable in the offseason. We considered going last October and I found really good hotel rates. On this very cold day, this post is very inspiring. This makes me want to go to Greece!!! Looks amazing. Santorini has been on my “to do” travel list for a while, I need to plan a trip there soon!